The Center for Independent Living has been around since the 1960s but they never stop offering fun events and opportunities for individuals with disabilities to try out various sports and recreational activities and we have some good ones for you to check out. WHEELCHAIR TENNIS - Open to players of all ages and abilities, you can learn or practice your tennis skills. Equipment and lunch are provided at no cost. Saturday, Aug. 26th from 10 a.m. to 2 p.m. at the College of Alameda Tennis Courts. REGISTER HERE. QUAD RUGBY & LACROSSE - On select Sundays, come out and join the NorCal Lacrose team. All practices are free and everyone is welcome! If equipment is stopping you, let it no more. We provide all equipment including sports chairs. Sessions are from 10 a.m. to 1 p.m. at the Alameda Point Gym, 1101 West Red Line Ave., Alameda. Check out CIL's Calendar for the next date. 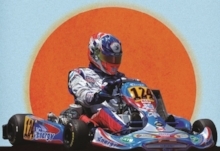 KART RACING - That's right, you read it right. This is a new project that The CIL is very excited about. Do you want to race go-karts? All karts will be fully equipped with hand controls. Tell us that you want to race and we will contact you with our first date available. CLICK HERE to add your name to the list. You can always contact CIL by phone for additional information: (510) 841-4776.